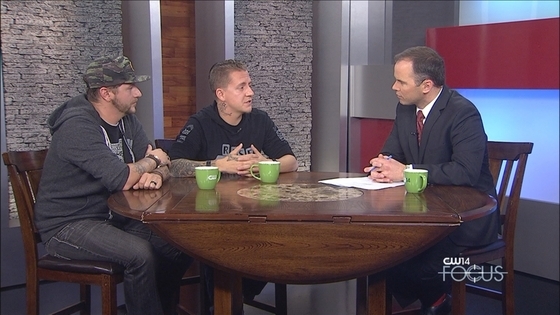 This week on CW 14 Focus host Robert Hornacek was joined by two guests who have overcome addictions in their own lives and are now trying to prevent others from going down the same path. Anthony Alvarado and Douglas Darby appeared on the program. Alvarado and Darby are the co-founders of Rise Together, a school-based, addiction prevention group in northeast Wisconsin. The group has given presentations to students at more than 150 schools. On the show, Alvarado and Darby shared their own struggles with addiction. They will also talk about the message they share with middle school and high school students and how addiction can be overcome. CW 14 Focus is a weekly, half-hour interview program that focuses on the issues important to people in northeast Wisconsin. Each week, Robert Hornacek will sit down with a different guest and go beyond the sound bites. The program will highlight the people making a difference in the community and give viewers an opportunity to get in depth perspective. CW 14 Focus airs Sundays at 10 a.m.